Killer Google Chrome Features You Never Knew. Chrome's market share has been ever increasing since it was first introduced in December 2008. Even after being a new entry, its minimalistic, feature rich and simple interface gave it a lot of loyal followers. Most of us use chrome for our day-to-day browsing. But there are a lot of hidden features deep inside Chrome which are really "COOL", but you never knew. And these are not just features for the nerds, but real productivity enhancers for the common user like you and me. Lets see more of these killer features. 1. Paste and search & Paste and go. This is one of Chrome's most useful features that misses the eye. The most common way to open a copied url is to do Ctrl+V and enter. Instead, you could just right click on the address bar and use the "Paste and Go" option. If you have copied some text you want to search, there is a "Paste and Search" option too. 2. Pin and Un-pin tabs. If you find Chrome's tabs a bit big, you can right click on the tab and hit the "Pin tab" option. The tab will shrink to show only the favicon of the loaded page and glue itself to the extreme left. 3. Drag and drop to copy downloaded files. When ever you download a file, chrome shows the download bar at the bottom of the browser. If you want to copy a downloaded file to your desktop or any other open folder, just drag and drop the file from the browser to your desktop or the folder. Yes, chrome can actually do most of your simple calculations. So before going for the calculator, just type in what you want to calculate on the address bar and make sure you put an "=" at the end. The result will immediately pop up. If you have used the search bar in a website to search for something, you can directly search on that website without opening it the next time. Just start typing the first few letters of the site and hit "Tab". 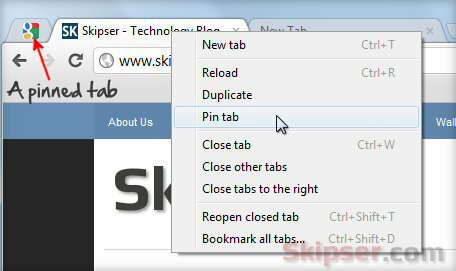 You will get something like "Search skipser.com" on the address bar using which you can directly search the site. Note: This works for most sites except for a few which doesn't use a search URL that chrome can understand like Facebook or Google+. For such sites, you can enable direct search using TAB if you can add the site's search engine to chrome. The easy way is to try right clicking on the site's search bar and see if there is an "Add as search engine" option. Text boxes on website could be very annoying because of their small size. Especially if the text you are typing is long, you will have to do a lot of scrolling. So here's how chrome makes it easy - just click and drag on the bottom right of the text box and you can re-size to suite you. If you have a slow machine or one with relatively less RAM, having too many tabs could slow down the browser. 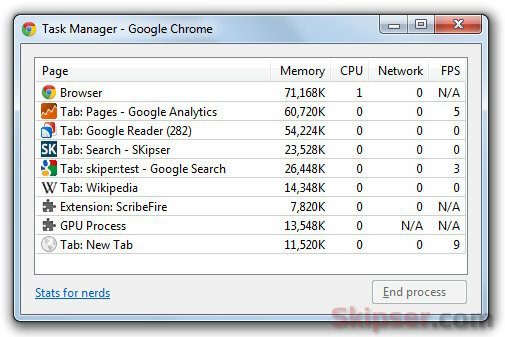 In such cases, you can use Chrome's Task Manager to see which tabs consume the most memory and CPU. 8. Reopen all previous tabs. Chrome by default opens a new tab when started. If you would like to start with all the tabs that were open when you closed chrome, just set the "Continue from last time" option for "On Startup". This is like an AK-47 for web developers. On a blank area of a website, do a right click and you will find the "Inspect Element" option. It brings up a window at the bottom of the browser with a gold mine of information like the elements in the page, cookies set, loading time of each element and lots of others. 10. Paste text without formatting. When ever you copy and paste text into some application editor like Gmail, you would find that all the text formatting also gets copied including links. Normally what one would do is to first paste the text into some simple editor like notepad, copy it from notepad again and paste it into Gmail. Chrome makes it easy - just copy the text and do "Ctrl+Shift+V" instead of the usual "Ctrl+V" to paste the text with all the formatting removed... very simple isn't it? So hope you have learned something new about chrome today. If you happen to know any other of Chrome's secrets, please do add in as comments and I would be glad to add it to the list. Wow, this is totally cool. Really nice features that chrome has. Google Chrome has a lot of killer features hidden behind its simplistic interface that can blow you away. These productivity enhancers are a must know.